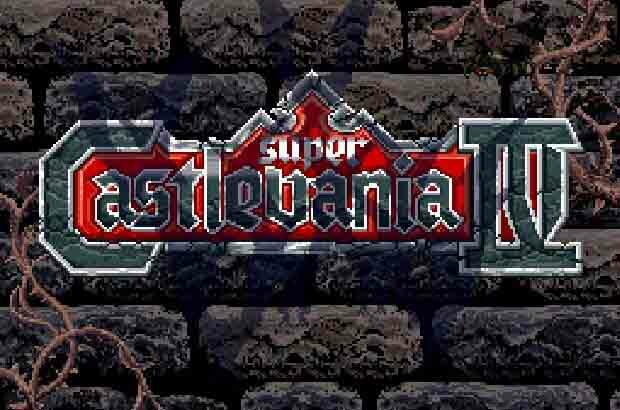 Super Castlevania IV is a 2D action platformer that is in the same style as the previous three Castlevania games and it also has some similarities to the Mega Man and Mega Man X series. It was first released in 1991 for the Super Nintendo SNES but since then it has also been released for Nintendo’s Virtual Console for the Wii in 2006 and then the Wii U in 2013. 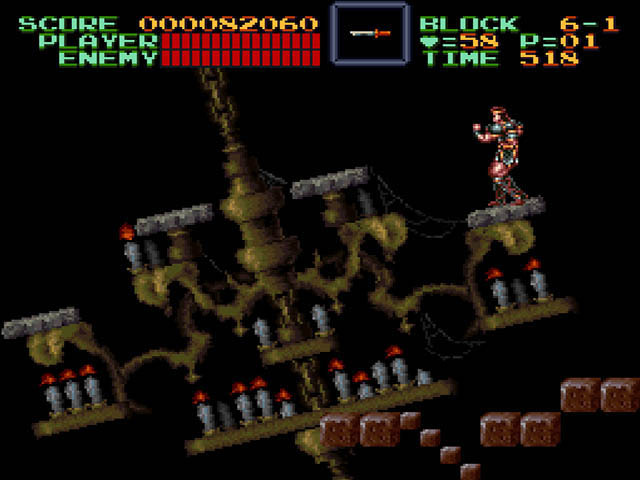 It is technically a remake of the original 1986 NES version of Castlevania. If you have played the original then you can see some of the similarities. It has been 100 years and the good in the world has faded. Dracula’s powers have increased he grows stronger as the good grows weaker. 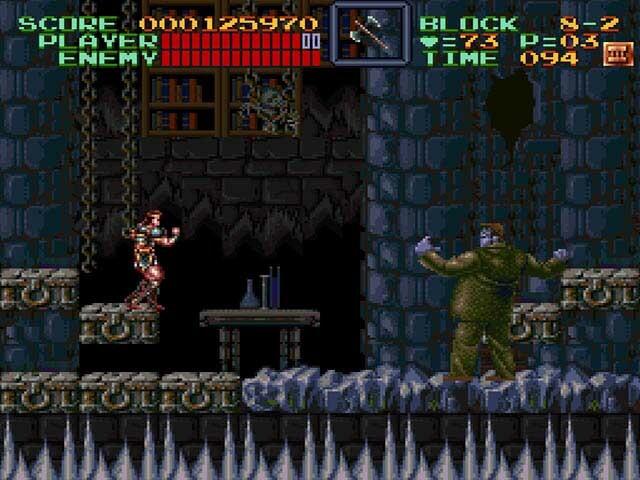 Simon Belmont takes up his whip and start the journey to Castlevania, he and his family are the only ones to have ever beat Dracula. 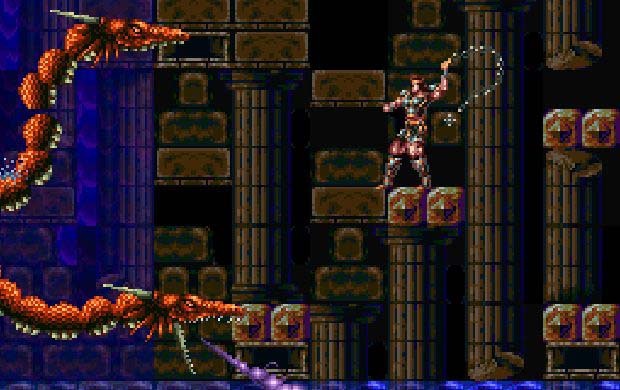 Not many people know that Castlevania IV is a remake of the original NES game. Since it is a remake and not a remastered game there are some huge improvements. The whip is very useful you can attack left and right of course but now you can hit above and below you too. We can’t tell you how many 2D platformers will not let you attack above and below you. You can even hold the button down and flail the whip in front of you allowing you to hit multiple targets quickly or let it hang down and creatures will walk into into the whip causing them damage. Flailing and waiting for them to walk into the whip does not do as much damage as hitting things but there are times where all of the techniques can be used to you advantage or is the only choice. The platforming is not just jumping from one thing to the other. You have to use the whip to swing across things, wait as the level itself is rotating leaving you hanging from hook and there are secret rooms and more than one direction you can choose as you find your way. Even little things like the creatures are good. There are remakes of classic monsters but some thought is put into them, they did not just phone it in to creature design. This game really pushed the SNES to the max when it came out. There are tons of boss battles and even the ones that were difficult we wanted to play over and over. Castlevania IV took us around 7 hours to get through the game and the time frame is going to stay pretty close each time you play it all the way to the end. This game is very challenging and there are some small control issues here and there but overall they are spot on most of the time. You do however still get thrown back if you get hit like in the first Castlevania but not as bad as it is in the original game they at least fixed that in this remake. We actually like this game better on Nintendo Virtual Console more than on the SNES. This is because of the save system. Once again this is a challenging game and being able to save on the fly almost anywhere made us not only keep playing but replay again. But if you find a SNES copy you will still have fun and there are cheat codes if you get stuck on a level. It is worth paying $7.99 or under on Nintendo eshop. That price you are going to be stuck with, as with most of the Nintendo exclusive classic titles it almost never goes on sale, but luckily it is worth it normal full price.